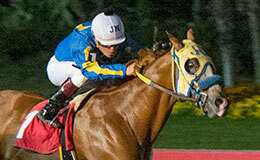 Champion 2-year-old J Fire Up is back in action on Saturday when she faces a strong field in the second of three trials to the $152,000 PCQHRA Breeders Derby. LOS ALAMITOS, CA—SEPTEMBER 13, 2018— Champion J Fire Up will look to avenge her fourth place finish in the Governor's Cup Derby final when she takes on Black Fryday and Chance To Fire, the top two finishers in that race, in the second of three trials to the $152,000 PCQHRA Breeders Derby on Saturday night at Los Alamitos. Nine races are on tap with the derby trials slated as races seven, eight and nine. First post time is 6:55 p.m. It was a rare loss for J Fire, who entered the derby final having won eight of her first 10 career starts. The Kiddy Up filly was bumped at the start and from there it was too tall a mountain to climb against fast starts from both Black Fryday and Chance To Fire. Owned by Darling Farms, Jaime Gomes, and Ernesto Solis, J Fire Up now enters this race after a strong turn and work of :12.20 at 220 yards. Jose Nicasio will pilot the 2017 champion 2-year-old from post number eight in the 400-yard trial. Ron Hartley's Black Fryday came into the Governor's Cup Derby in great form after hitting the board in six consecutive starts. On derby night, the Favorite Cartel gelding ran the race of his life, breaking sharply from post nine on the way to an easy 1-¼ length win. For jockey Eddie Garcia, the win helped him become the first jockey at Los Alamitos to reach 150 career stakes wins. Garcia will ride Black Fryday for trainer John Cooper from post number two. Abigail Kawananakoa's Chance To Fire ran second in the derby final, which matched his runner-up effort to J Fire Up in last year's Governor's Cup Futurity. A top three finisher in eight of nine career starts, the Walk Thru Fire gelding is not the quickest out of the gate, but he accelerates fast and often displays strong finishes in his races. Cody Jensen will ride for trainer Chris O'Dell. This trial will also feature Jess My Kiss, the 24-1 longshot winner of the Grade 1 Los Alamitos Winter Derby, plus impressive Jens List Memorial Stakes winner Diamonds Blue Eye and Way Maker Handicap winner Fyrefly Jo. In the first of three derby trials, Grade 2 Golden State Derby runner-up Apollitical Stone will take on the brother-sister combo of The Revenant and Remember The Rose. Racing for Jose Flores and Steve Mickaelian, Apollitical Stone is a three-time graded stakes finalist and the winner of the Oatman Handicap earlier this year. The son of Apollitical Jess was fifth at the start of the Golden State Derby before making up ground early in the race on the way to running second. Jairo Rangel will be aboard for the third race in a row. Hartley's The Revenant was a multiple futurity finalist last year and has already competed in three stakes races this year, while Dr. Steve Burns and James Markum's Remember The Rose comes in after 3/4 length allowance win at 300 yards. The Revenant and Remember The Rose are both out of the graded stakes winning mare Remember Me Rose. Lisa Anderson's always consistent Moonie Blues looks like the one to beat in the final trial. Following a terrific 2-year-old campaign, the Freighttrain B filly has already run third in three graded derbies this year - the Grade 1 Los Alamitos Winter, the Grade 2 Golden State, and the Grade 3 La Primera Del Ano Derby. While she's yet to win a race this year, she's hit the board in all six of her starts in 2018. She'll now be taking on a strong field that includes Governor's Cup Derby third place finisher Dont Foose With Me, recent stakes winner On Our Way, and California Breeders 550 Yard Sophomore Stakes winner Rockin Asteroid. Platki, a Grade 1 futurity finalist last year, is making his second start of 2018 in Saturday’s trials.